Our experts and consultants dutifully research, present, photograph and market historic materials and ephemera to enable the consignor to reap the full monetary benefits when choosing Alderfer Auction. In recent years Alderfer Auction has successfully offered the Smillie Family Estate (world famous engravers), the General George Meade collection (victorious commanding general at the battle of Gettysburg), the General Lyman Lemnitzer collection (famous American general and ex-Chairman of Joint Chiefs of Staff and NATO), and the Jim Mountain collection (World War II collection including General Eisenhower jacket and D-Day flag). Our company has offered single items with direct associations to George and Martha Washington, Benjamin Franklin, Brigham Young, the American Civil War, the Revolutionary War, Napoleon, Waterloo and many others. 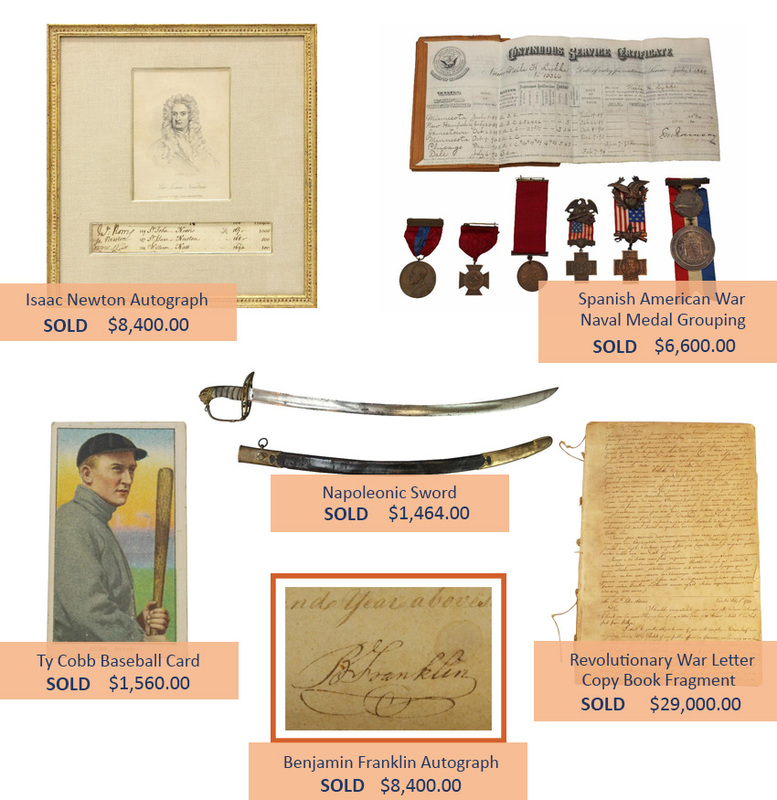 When consigning a single item, large collection, or a complete estate of historical importance the staff and consultants at Alderfer Auction will insure that your items are offered to the world the right way. This will include extensive research in necessary, proper marketing (including press releases with photographs) and the use of internet sales venues to insure that the materials offered realize the best price. If you as a consignor wish that your materials should be offered to an institution or museum you can meet with our staff and consultants to discuss your path forward. We at Alderfer Auction have helped in private treaty sales to institutions to enable a family/consignor with a significant legacy to be rewarded and an institution to obtain items that they can proudly display/utilize. Alderfer Auction is privileged to have a 30 year relationship with Robert Lucas, consultant to Alderfer Auction. Mr. Lucas is a noted authority and collector in the fields of Historical Autographs, Photographs, Military, and ancient artifacts. Mr. Lucas has shared his knowledge nationally by lecturing to collectors groups, Auctioneers associations and written publications. Night Before Christmas 1st ed.